Just a few more Stamps. Have'nt heard from you for quite some time - Sincerely hope both you & Jim are in good health & alls well & Happy. Note four of the slides was the best you could do with me as your subject. Unfortunately, I am not too photogenic as a model. Just not the type. I am a better subject for ‘oils’—Crisco preferred. Pleased to know you & Pat had such a nice evening at the L&H Premiere - note the titles of films shown - a very good selection. I can imagine Pat enjoyed the affair & meeting new people - a nice change for her as I imagine she is pretty much confined to the home & taking care of the "BRATS"! (My apologies to the little DARLINGS.!!) Note 4 of the slides was the best you could do with me as your subject - unfortunately, I am not too photogenic as a MODEL - just not the TYPE - I am a better subject for 'OILS' (CRISCO PREFERRED). I am more in the 'Fish' Category.! especially "Fillited' with the head cut off. Your plan for a meeting this Summer at your place sounds very interesting - the barbeque thought is quite inviting - maybe the screening could take place in the Garden to climax the barbeque - no doubt your fences would be lined with neighbors & their kids - suggest before you start the show you get the neighbors to clear away & wash the dishes. All those we made for 20th Century Fox were very bad. Working at that studio was a very unhappy experience for us. We finally quit, just couldn’t take it any more. Unfortunately we quit too late, the damage had been done. Thanks Jennie your letter of May 31st.ult. Frankly I never liked the "Bullfighters" film - in fact all those we made for 20th.Century Fox were very bad - working at that studio was a very unhappy experience for us - we finally quit, just could'nt take it any more - unfortunately we quit too late, the damage had been done - will never know why we were so badly abused by this outfit. Anyway, its still an unhappy memory. Looks like you all had a BALL entertaining TILLY you really all went to Town to give her a good time - I can imagine you're all worn out - plus a nice Hang-over.!! It was certainly a nice change for you to get away for a while - I can understand you're getting 'Shikkered' to put some life into the PARTY.! only hope you wo'nt suffer any 'After-effects'. I have'nt been feeling too good - the diabetic dept.gets out of control once in a while without any apparent cause, high sugar no matter how much extra insulin I take its quite disturbing at times & distressing - have no energy, neglect my correspondence which bothers me quite a bit. I've too been getting water in the ankle area, all swollen, am taking shots & pills for that - one dam thing after another it makes you feel so happy you want to throw yourself away.!! Note re the cooling system - sounds like sabotage to me JACK.!! somebody turned off the heat deliberately - if you want to try out the system, fill up the furnace & heat the house inside.! SIMPLE.!! RIGHT TO THE POINT.!! Nothing new Jennie, so please convey my best to the Family. Take care of yourselves Jack & Jennie. Thanks yours recd. this AM. Am a little confused re returning your letter with the Picture for Mr Franklin - can't figure how that happened - had no reason to put that in the envelope - I do recall your mention of a tape recording you were to make on the Franklin show but you followed that up with a card in effect the tape was'nt too good & you'd decided not to send me a copy - hence I did'nt mention it any further. Pleased Mr Franklin was happy with the picture. Re the 90 minute L&H film - this is the first I've heard of it - whoever [came up with] this idea is CRAZY - I did hear that Hal Roach Sr. & Jr. had plans to produce some films again - does this stupid idea have anything to do with them?? - I would'nt be at all surprised. The kindly description you give of my voice on the phone is probably due to the fact that when you talked with last - THAT WAS A RECORDING!!!. Kidding aside Richard - your idea to have me Narrate is definitely out - I have no desire to get involved with this ridiculous project - apart from this, due to our agreement (deal) with Monsieur Larry Harmon I have no choice in the matter & as I say, I'm not in the least interested - anyway, I appreciate very much your kindly interest in the situation. I have'nt been feeling too well, once in a while the diabetic dept. gets out of control - its pretty disturbing till it gets adjusted again - very distressing at times - just have no energy - neglect my correspondence - just feel plain lousey - am doing everything necessary to get hack in stride, but its a slow procedure - very discouraging. Dear Trixie [Wyatt]: Thanks your welcome letter. That photo you mention in the paper is not me not my daughter - my daughter is married & I have two Grandchildren & as you surely know I am unable to travel due to my ill health situation - I know of this chap, he claims his family name is Laurel, he's a night club entertainer & poses as my Brother - Joe Laurel.! Jackie Harrison died several months ago sorry to say he suffered a stroke. About all for now Trixie - Eda joins in love & kind thoughts - Take care -God Bless. Thanks Tom [Sefton] for the card - appreciate very much your kind remembrance. Just mailed you under separate cover a tape recording - think will interest you - background musical score specially arranged for the L&H silent film "Putting Pants on Philip" also a music score with sound effects for "TWO TARS" I assume you have prints of these. Mrs L. joins in kindest & besets to you all. Thanks Bob & Judy [Wright] for the return of the tape & extra copy of background music, also the self threading reel - this should prove very popular, very unique. Several friends dropped in to celebrate my birthday - your cake was a big success not a crumb left!! & the little boy got none!!! 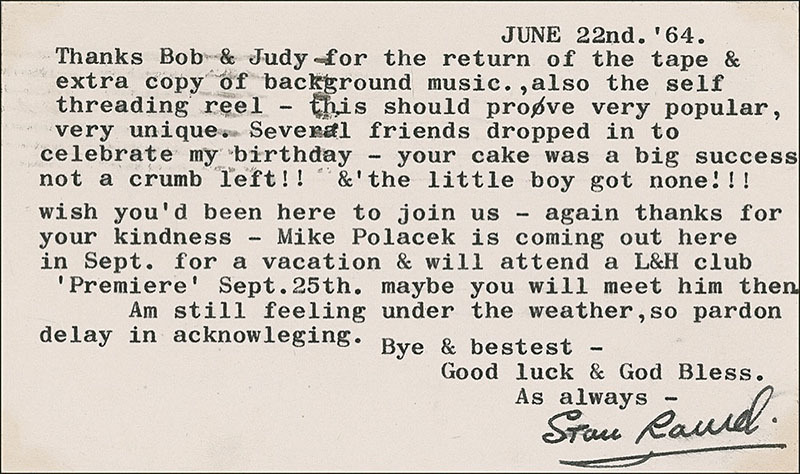 Wish you'd been here to join us - again thanks for your kindness - Mike Polacek is coming out here in Sept. for a vacation & will attend a L&H club 'Premiere' Sept.25th. maybe you will meet him then. Am still feeling under the weather, so pardon delay in acknowledging. Thanks your very nice letter 12th.inst. conveying Birthday greetings with gift of Lottery ticket which could possibly give me heart failure & am willing to challenge.! Mrs L. (EDA) joins in thanks to Elizabeth & self for the very kind gesture, certainly very sweet of you. Note you bought a home - congratulations - wish you both many years of happiness & continued success in "BUXTON HALL". Congratulations too on your winning an 'EMMY' award - am sure you both are very proud. 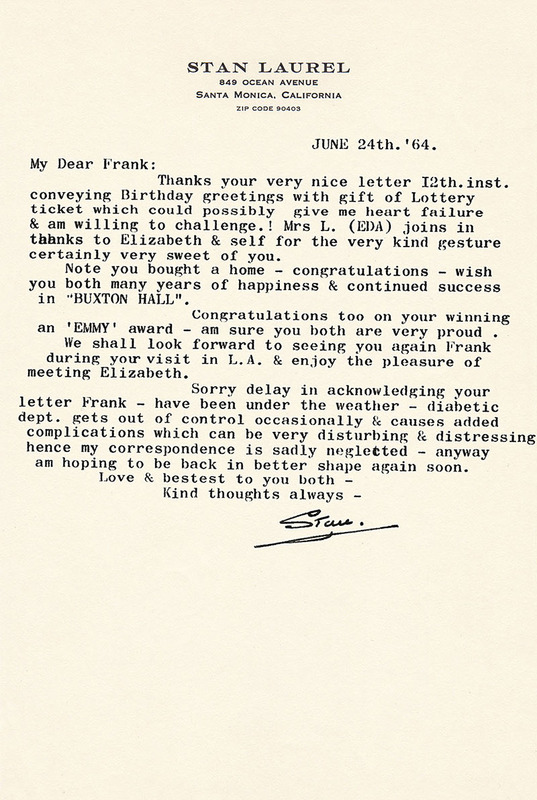 We shall look forward to seeing you again Frank during your visit in L.A. & enjoy the pleasure of meeting Elizabeth. Sorry delay in acknowledging your letter Frank - have been under the weather - diabetic dept. gets out of control occasionally & causes added complications which can be very disturbing & distressing hence my correspondence is sadly neglected - anyway am hoping to be back in better shape again soon. Frank Buxton won an Emmy Award for Discovery, which he hosted, in the category of “Outstanding Program Achievement in the Field of Children’s Programming” at the 1963-64 Emmy Awards held on May 25, 1964. Dear Maxine Warren: Thanks for your very nice letter - indeed nice to hear from you & to know the old L&H films are still affording you so much pleasure - appreciate very much your kind sentiments so warmly expressed. 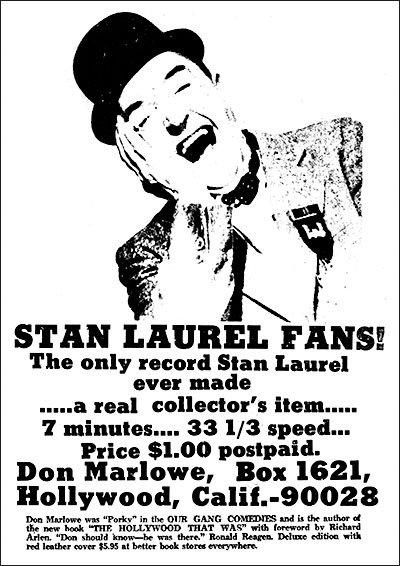 In 1968, just a few years after Stan Laurel died, a man by the name of Don Marlowe ran an ad in 8mm Collector. He was selling a 1964 recording he made of himself talking with Stan on the telephone. The recording was pressed onto a 7" record. In his ad, Mr. Marlowe also fraudulently claimed to have been “Porky” in the old Hal Roach “Our Gang Comedies.” I suppose, in the late ’60s, when information on the silent film days was scarce, it was easier to perpetrate a hoax like that. 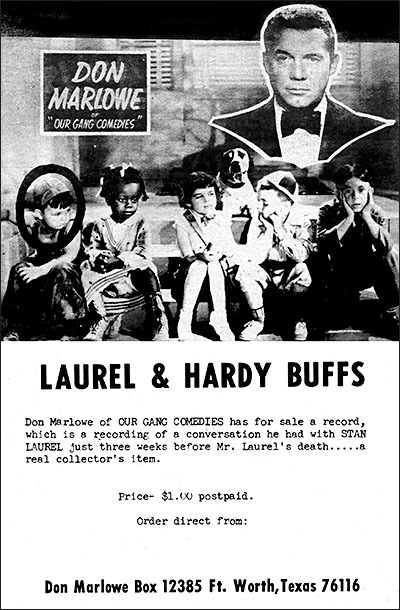 In fact, over the years, there have been many people who claimed to have been members of the “Our Gang” group. I’m not sure what became of Mr. Marlowe once the real “Porky” was discovered (Colorado teacher Eugene Gordon Lee), but he did continue to run ads in film magazines, only now sans his inaccurate boast. Marlowe, who apparently did know Stan in his later years, was also a friend of other Hollywood legends including Bela Lugosi. He was a bit-player in Hollywood “B” pictures and appeared in a film titled Squad Car in 1961. He also wrote a book in 1969 titled, The Hollywood That Was about his “mis”-adventures in the film business. 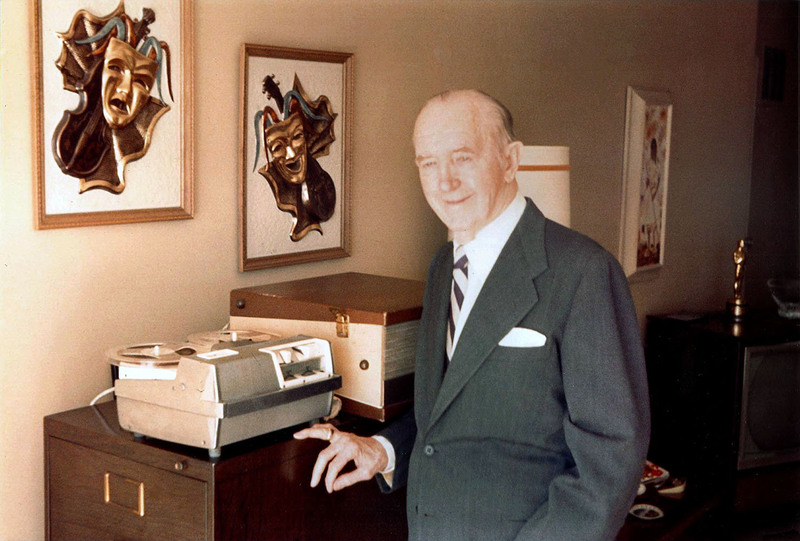 In 1970, Don Marlowe wrote an article about the recording as well as his close friendship with Stan Laurel. During the latter years of Stan Laurel’s life it was difficult for him to get around. I once offered to take his tape recorder to a shop to have it repaired. As I recall, the bill came to only $1.10. When I brought the recorder back to Stan, he asked me how much I owed him. I told him to forget about it. He insisted on reimbursing me for my outlay and found he did not have quite as much cash. He then wrote a check for the small amount and commanded me to accept it. I really did not want Stan to reimburse me, as he was a good friend and when I got home later I tore up the check. A number of years ago, on a rainy Sunday afternoon, I was at a television station and happened to telephone Stan, and turned on a recorder. With no thought of anything in particular in mind, I took the recording home with me and several days later put it away with some other things in storage. 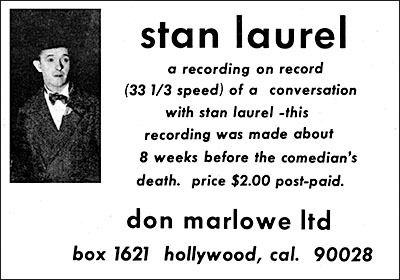 A few years after his death I was told that I was the only person in the world who had ever made a [telephone] recording with Stan Laurel. “Because of many requests from people all over the world for a copy of this recording, I decided to put the conversation on a record. When the record was released, to my surprise, I received thousands of orders for it from all over the world. This record I have been told is now considered a real collector’s item.